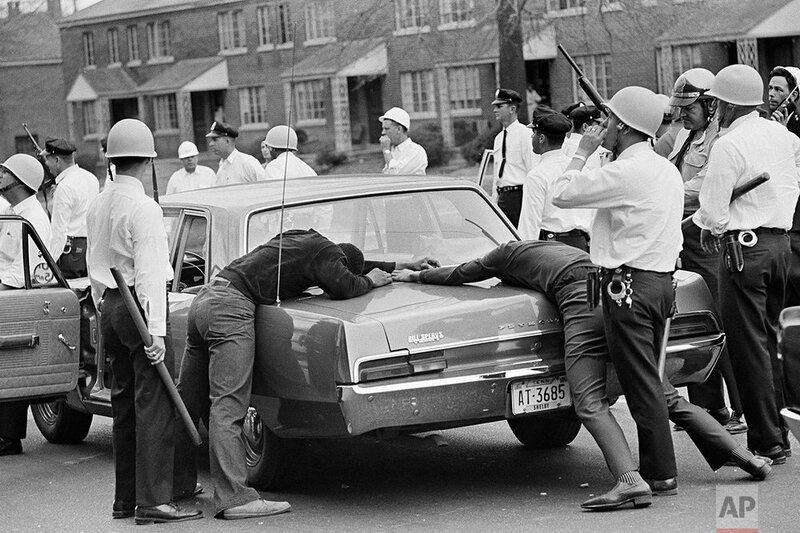 AP WAS THERE: 50 years after the death of Martin Luther King Jr.
On April 4, 1968, a single bullet fired in Memphis, Tennessee, changed the world. Martin Luther King Jr. was shot and killed on the balcony of the Lorraine Motel after helping to lead a peaceful march in support of the sanitation strikes. The civil rights leader had carried the banner for the causes of social justice – organizing protests, leading marches and making powerful speeches exposing the scourges of segregation, poverty and racism. The legacy he left behind is long and storied. Fifty years after King’s death, The Associated Press revisits its historical coverage of this moment in history. Memphis editor Doug Stone published this story the night of King's death. Note: The story incorrectly states that King was killed on Wednesday night; the night of April 4, 1968 was a Thursday. MEMPHIS (AP) — Nobel Laureat Martin Luther King Jr., father of non-violence in the American civil rights movement, was killed by an assassin's bullet Wednesday night. King, 39, was hit in the neck by a bullet as he stood on the balcony of a motel here. He died less than an hour later at St. Joseph's Hospital. Gov. Buford Ellington immediately ordered 4,000 National Guard troops back into the city. A curfew, which was camped on Memphis after a King-led march turned into a riot a week ago, was reimposed. Striking Memphis sanitation workers in 1968. Police said incidents of violence, including several fire bombings, were reported following King's death. The 1964 Nobel Peace Prize winner, was standing on the balcony of his motel here, where had come to lend protests in behalf of the city's 1,500 striking garbage workers, most of them Negroes, when he was shot. Two unidentified men were arrested several blocks from the motel. Police also said they found .30-.06 rifle on Main Street about one block from the motel, but it was not confirmed whether this was the weapon that killed King. An aide who was standing nearby said the shot hit King in the neck and lower right part of his face. "Martin Luther King is dead," said Asst. Police Chief Henry Lux, the first word of the death. Asst. Hospital Adminstrator Paul Hess confirmed later that King died at 7 p.m. of a bullet wound in the neck. The Rev, Jesse Jackson said he and others in the King party were getting ready to go to dinner when the shooting occurred. "King was on the second floor balcony of the motel," Jackson said. "He had just bent over. If he had been standing up, he wouldn't have been shot in the face." In this short documentary film, we revisit the events leading to and following the death of Dr. Martin Luther King, Jr. fifty years after his assassination. This short documentary weaves AP's archival photography and video around testimony by AP reporter Kathryn Johnson. After the death of two sanitation workers in February of 1968, members of the sanitation workers' union went on strike to protest working conditions. One of these workers was Elmore Nickleberry, now 86, who continues to be employed by the Memphis Sanitation Department as a crew chief and truck driver. Here, he recalls his early days as a sanitation worker and marching with King. AP’s complete coverage on the 50th anniversary of Martin Luther King Jr.